Having implemented a new Enterprise Content Management Solutions is not enough for organizations to fully exploit the treasures of information buried in their content repositories unless the new content repositories are loaded with the backlog of historical content accumulated over the years. The process of backlog loading in new repositories is a hectic process including documents receiving, un-stapling, scanning, image processing, indexing, quality assurance, re-stapling, and submission of documents. IT-Blocks have developed a unique Methodology for Managing the Backlog content load. 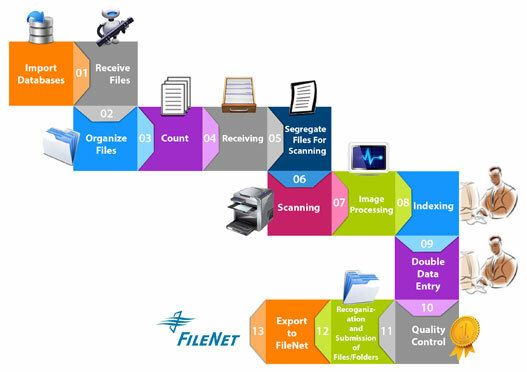 Covering the above processes loosely coupled with many types of scanners. Besides, integrated with the methodology, IT-Blocks has developed an application – IBBSS – where IT-Blocks does not only manage the process of backlog loading but also produces the content data in an XML format ready to be migrated into the new content repository. Employing proven, secure technology solutions and conversion methods enable us to carry out even the most challenging assignments. IT-Blocks has an experienced team of document scanning experts to support large-scale projects that require quick turn-around-time and high-quality deliverables. By making use of our highly acclaimed Scanning and Indexing services, you can prevent the hazards of maintaining all the business documents in hard copies. You can convert and save all the necessary large data and images in digital format. Based on the analysis phase, some data fields are to be entered for each document. Those data fields are the same for each document type. Those pieces of data will generally be taken from the first page of the document itself. A list of Documents and corresponding data is produced in a report for the quality control to revise data entered and ensure correctness and completeness. After having been approved from customer quality control, Files are resubmitted back to Customer. A number of submitted Pages per day should be similar to the number of received ones one or two days before.